The Hongkong Engineering & Construction Co., Ltd. (HKECC) was founded in Hong Kong in 1922. During its early years, the company was a civil contractor undertaking building, foundation and government works projects. 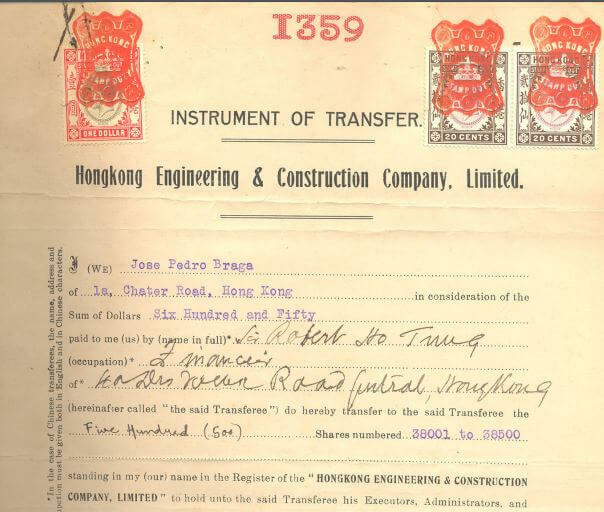 In 1923, HKECC acquired the sole rights for Franki piles in Hong Kong and China on a ten year rolling contract. The company’s first directors included Robert G. Shewan of Messrs. Shewan, Tomes and Co., Reverend Father Souvey of the French Missions Étrangères, and James Taggart, the Scottish Managing Director of The Hongkong Hotel Co.
Elly Kadoorie later joined the board in 1930, with Lawrence Kadoorie appointed as his father’s representative in 1931. The Hon. Jose Pedro Braga (J.P. Braga) was appointed Chairman in 1930, and to a large extent was responsible for the reversal of the company’s ailing fortunes, which were multiple due to a turbulent decade of labour unrest, scarcity of work, industrial depression and severe competition in the 1920s. Due to the association of businessmen who had great confidence in the future of Kowloon, namely J.P. Braga, Elly Kadoorie and Robert Ho Tung, the company purchased about 30 acres of barren hills near Kowloon Tong which saw the creation of a Garden City in Kowloon. This shift from contract work to residential property developer was to ensure the company’s future success. Important pre-war projects undertaken by the company included… the construction of Hok Un Power Station for China Light: “In 1934 a committee [at CLP consisting of directors and senior staff was formed to deal with the extensions proposed [at Hok Un PS]. It met regularly for the next several years and made many important decisions based quite often on the advice of Preece, Cardew and Rider. …, and piers and godowns for the Hongkong and Kowloon Wharf and Godown Co., Ltd., and air-raid tunnels, shelters and storage buildings for the Hong Kong government. In the post-war years, following the war-time deaths of J.P. Braga and Elly Kadoorie, Lawrence became Chairman of HKECC whilst Horace Kadoorie was appointed Director. This article was first posted on 22nd December 2016. See: The Hong Kong Heritage Project (HKHP) was founded by Sir Michael Kadoorie in 2007 to preserve history and promote the appreciation of heritage in Hong Kong. HKHP holds a unique collection of archives originated from CLP, the Hongkong and Shanghai Hotels and other Kadoorie businesses and interests, which includes oral histories relating to Hong Kong’s wider social and economic development post-war.